Here are the stories I wrote for Generocity.org this year. It’s a nifty little website that, gasp, focuses on positive things happening in and around Philly. No, I don’t mean a bottle of Firestone Walker 17 Year Reserve showing up at the Pour House beer fest this summer. I mean non-profits and the people who run them striving to make the region a better place. I just found out that the article I wrote about the collab between the Food Bank of South Jersey, Campbell Soup and local farmers was the most-viewed post of the year. Does this fact merit a mention on my resume? Nah, I didn’t think so either. Here it is, if you want to read it or know where to buy the Just Peachy Salsa. Just Peachy, a collab b/t the Food Bank of South Jersey, Campbell Soup and local farmers. I was very proud of this article, which describes the unprecedented greenliness of the Barnes Foundation. If you haven’t been yet, go. And take an architecture tour. 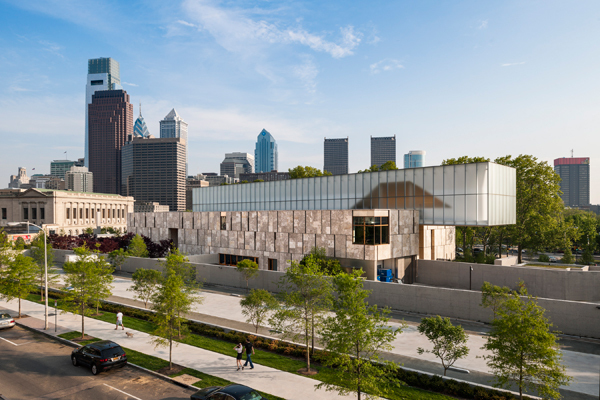 Rendering of the LEED-certified Barnes Foundation, designed by Williams + Tsien, with the landscaping done by Olin. Funny story. I took this assignment because I thought it was about someone doing something cool and fair-tradey with coffee. I mean, my editor labeled it “Connecting Coffee.” I didn’t realize until I did research the day of my interview that it was about a regular coffee get-together for professionals in the non-profit world. Ha ha. I told the interview subject (afterwards) and we laughed so hard! I’m glad I wrote the story, though, because Ashley Tobin of Work Better Consulting is a really cool and forward-thinking lady. Work in non-profits or their suppliers? Check her out. Not such a funny story. But a nice one. Maureen Rush, who’s a mega-bigshot at Penn, was appointed as the first woman to lead the non-profit Philadelphia Police Foundation. What’s that? See here. This story had me examining the efficacy of anti-gun-violence programs in the city and nationally. Made me miss my dear old friend Rob Stuart of Evolve Strategies, who was a huge anti-gun advocate in Philly who passed away way too young. Neighborhood Film Company: A Business with a Social Mission — These guys are amazing. You should definitely read this, especially if you’re interested in homelessness or film. Global beauty company succumbs to pressure, does good. Why you must go to the Philadelphia History Museum now. Questlove and Black Thought will always rule Philadelphia, and the Mural Arts Program agrees. Is solar power a viable option for Philadelphians? “Philadelphia is to beer what Sonoma is to wine,” says Keith Wallace to anyone who’ll listen. Considering the source, the proclamation, perhaps incendiary outside Pennsylvania, might sound outright puzzling within city limits. That’s because in 2001, Wallace, a winemaker, wine columnist, and author of two upcoming wine books, founded and still runs Philly’s best-known vinology school. So why is he extolling his territory’s beer lust at the expense of its pursuit of viticultural knowledge? Because, acknowledging a craft revolution, he’s invited beer to take a permanent seat at The Wine School’s table. Wallace’s partner, a burly bald man named Dean Browne, asserts the alliance as he introduces himself to a group assembled in one of The Wine School’s classrooms on an early March night. As Browne speaks, dozens of bottles of obscure brews from Scotland, Japan, and Delaware linger behind him, waiting to be poured into students’ glasses. Despite the encroachment of a poster for The Wine School and a wall-sized vintage advertisement for a defunct wine co-op on his lecture space, Browne spends the next two hours pouring samples of Gooseberry Ale and Hitachino Nest Real Ginger Brew, passing around baggies of juniper berries and wormwood, and dissecting in a jocular manner the history and legacy of pre-hopped beers. This is how Browne, a brewer at Philadelphia Brewing Company (PBC), has occupied himself for many a Friday night since he and Wallace founded the Philly Beer School last March. The two met while Browne was taking a class at The Wine School and, sensing the opportunity to fill a vacant niche in a craft-beer-thirsty city, they partnered to open the Philly Beer School. Browne operates the beer school while Wallace maintains ownership of both programs. “It’s wonky, it’s fun, and I noticed that brewers were going through my wine programs because there really wasn’t anything out there for them,” Wallace says via phone. To that end, he and Browne schedule bi-monthly one-time classes like Beer Wars: Old World Vs. New World Brews and Beer and Homebrewing 101. Students comprise aspiring brewers, elderly couples, first dates, groups out for girls’ night, and sons treating their dads to birthday celebrations. In just one year, Wallace says he’s taking in a profit and all of his classes are selling out despite no advertising budget, no quid-pro-quo with breweries, no public relations firm, and practically no local press. What he does have working in his favor is a dedicated repeat business, a solid pull from his wine school roster, and a regional pool of potential clients whose curiosity is piqued by an onslaught of mainstream craft beer news. What he also has going for him is a unique identity as the only full-time beer school operating outside of academia in the U.S. Whereas other programs are either far more formal or far more casual, Wallace’s is the only business to exclusively offer regularly scheduled beer classes geared toward consumers and homebrewers. Wallace intends to be the first to add another particular dimension to the beer experience, as well. To mark the first anniversary of the opening of the school during last year’s Philadelphia Beer Week, he plans to announce the creation of the nation’s only homebrewer certification program during this year’s beer week, which has been moved from March to June. The course will start this fall and will consist of four weeks of classes and four weeks of immersive lab work at a brewery. The certification doesn’t afford recipients anything but bragging rights — yet — but Wallace says he’s developed wine certifications that have caught on throughout the industry. As a pioneer in using education to simultaneously deconstruct and advance the mystique of wine and craft beer, Wallace knows better than anyone that there remains one key difference in approach, based on whether the conversation centers around Philadelphia or Sonoma County, hops or grapes.